Welcome to the Smoky Mountains and Mountain Haven formerly Montini Manor. This 3 bedroom 2 ½ bath home offers an open and spacious floor plan with lots of glass to take in the mountain surrounding. Come warm up with a cup of cocoa and a roaring fire. Relax with your favorite movie or challenge yourself to a game of pool. This beautiful log home is located in Maggie Valley and puts you in easy driving distance to the Valley and all the area has to offer. Come ski, tube, take in a show, dine, shop, horseback ride, visit the elk, walk Lake Junaluska, step back in time in neighboring Waynesville, try your hand at Harrah’s Cherokee Casino or just come spend a romantic getaway in a true mountain setting. This home has a Gameroom with Pool Table; HomeTheater with Blue Ray and internet service. Mountain Haven will welcome you home and leave you with wonderful memories of your vacation getaway. Cabin was beautiful and had everything our family of 6 needed. It was clean and decorated for the holidays which we loved! Super quiet too! There is a small creek (maybe it was just run off from previous snows) that runs down the hill just on the other side of the driveway our kids enjoyed looking for “gold”. We intentionally booked the cabin because it was extremely close to town and kind of in a subdivision but still on the mountain. We did not want to deal with long drives into town or roads closed due to snow. I’m sure in the summer the other homes are not visible with all the trees. Backing out of the driveway is a bit tricky... we opted to back out and go up the hill then turn around to exit. We hope to book this cabin for our summer visit! The property was beautiful but the A/C didn't work! We rented a home in June that had no A/C. It got warm. I recently rented another home for this weekend here but realized it didn't have an A/C so I cancelled it (within terms) so we were disappointed when this A/C didn't work! It had been broken for a while as the condenser fan motor would get hot & stop! I will say that the Maint. Rep did try to get in touch with the owners as they contract with an HVAC company. 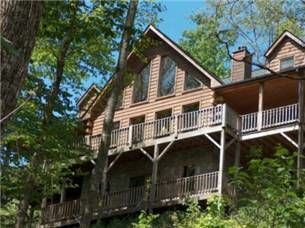 Fantastic Getaway Cabin in Maggie Valley - Not your typical Rental!!! My husband was born and raised in Haywood Co., so we come back to visit family regularly. We rent a lot of cabins, this was unlike anything we’ve rented before. This was more like someone’s personal home ... perhaps they just started renting out their summer home ... it was beautiful!! Finely crafted three story log cabin, the layout made this easy to separate the children from the adults. The entertainment room downstairs, the large living area with the fireplace on the main area, the large well stocked kitchen, the views from cover porch where we drank coffee in the morning and bourbon in the evening. We are definitely renting this cabin from now on! It’s off of Soco Road far enough to where you are secluded and it is peaceful but only minutes from all the activities of Maggie Valley. We gave this 4/5 **** because the cleaning crew did a poor job preparing for our visit (dusting hadn’t been done in weeks! Sticky spots on kitchen counters and floors) AND the directions to the cabin (we checked in on a Sunday were not clear, the emergency # woman was NOT helpful) need to be much more clear! If your NOT comfortable driving in mountains this driveway will be scary!! You have to back out into a very twisty narrow road. Depending on weather conditions you may need 4W/AW. We are used to the mountains and I was not thrilled pulling out in reverse in the dark using the backup camera and all 3’mirros (there is a steep drop off to the right of the driveway and just room for one big SUV or Truck). We call the Realty Company during the week for the frig and they were in it immediate and very friendly/attentive. Definitely 5 stars for handling that situation. Picking up the keys and property package on the weekend or after hours was also extremely easy. The are steep steps to enter the house and to get to the upstairs beds (2) or the downstairs (entrainment room). This is NOT this cabin for you if you are handicapped. Like I said, we are from this town and really enjoyed this property and will book it next time. Lovely home! Easily accommodated two couples for a week. Must consider it again for next year! Thanks for sharing your lovely home! Very comfortable and roomy with lots of space to enjoy being outdoors. Easily accommodates two couples with children. The kitchen is very well equipped. If you are looking for a get away to enjoy nature and cool mountain air, I highly recommend Mountain Haven.